White House press secretary Sean “Spicy Facts” Spicer is so out of his depth, it’s amazing to watch. 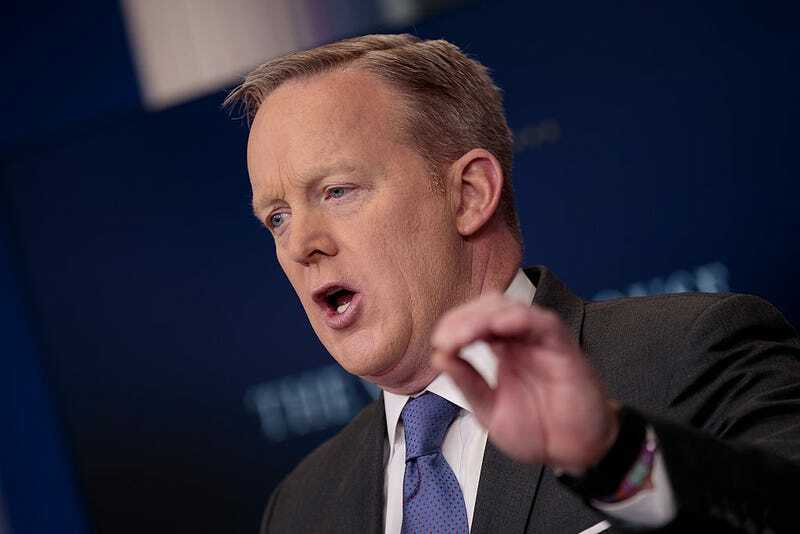 On Tuesday, Spicy Facts found himself knee-deep in a tense conversation with members of the press corps over a tweet sent out by the tweeter-in-chief. I know it’s difficult, but ignore the use of the quoted word “dudes” and focus on the fact that the president himself, who no one in his administration can keep off Twitter, used the word “ban” to describe what the White House has insisted isn’t a ban but is more of an “extreme vetting” process for people from seven Muslim-majority nations. Spicy Facts claimed that the shady news media has declared the move a ban (umm ... because it is!) and that the media has been perpetuating this falsehood. “So he says it’s a ban,” Welker said, Yahoo! News reports. “He’s using the words that the media is using,” Spicy Facts responded. “It’s his words!” a reporter shouted. Spicy Facts insisted that the order couldn’t be a ban because people are still being allowed into the country. “It is extreme vetting,” he said. “I understand,” Spicy Facts replied. So, “is he confused, or are you confused?” Welker asked. Spicy Facts also came for a New York Times report that “Secretary of Homeland Security John Kelly had not been properly consulted before the executive order was signed on Friday,” Yahoo! reports. “It was accurate,” Times reporter Glenn Thrush shouted out. “How can it be accurate reporting, Glenn?” Spicy Facts asked, noting Kelly’s Tuesday press conference in which he pushed back on the report. “You’re calling him a liar?” Spicy Facts asked. “I’m not calling him a liar,” Thrush said. I don’t know how long this contentious relationship will last, but let’s hope forever, because it’s awesome. Read more at Yahoo! News and the New York Times.